History: "In war-torn Europe, liberty and democracy exist mainly as memories! Millions writhe under the cruel heel of an arrogant dictator! Yet, though the hour is dark, a ray of light bursts through the clouds which have gathered across the face of liberty! Freedom is not dead! In the occupied territory there is a man who symbolizes the triumph of democracy! Daily he works under the very eyes of the brutal secret police! He brings a message of hope to the suffering people in the form of the letter `V'! `V' FOR VICTORY!" (Daring Mystery Comics #8, Comedy Comics #9) British officer Lieutenant John Watkins was reported killed during the retreat at Dunkirk. In fact he survived, but his superiors saw the opportunity to send him undercover into the occupied countries and help rally local resistance against the Nazis. Operating under the eyes of the Nazi secret police, he adopted the identity of Citizen V while fighting his secret war, leaving a V sign wherever he struck as a way of giving the resistance a symbol. He worked with the assistance of a group of freedom fighters dubbed the "V-Battalion". (Thunderbolts: Distant Rumblings -1; Captain America/Citizen V98 (fb),Thunderbolts -1) Citizen V formed a relationship with Paulette Brazee, a.k.a. the She-Wolf, a fellow resistance fighter. 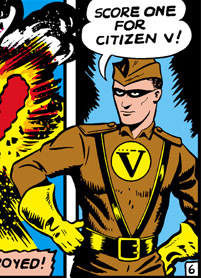 Citizen V died in 1943, strangled to death during the Warsaw uprisings by Baron Heinrich Zemo, but by this time the She-Wolf was pregnant with his son. First Paulette, then years later his son and grandson, would take on the mantle of Citizen V.